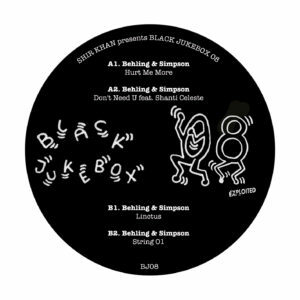 Shir Khan is back with the 8th edition for his Disco-House-Edit imprint Black Jukebox. This time he features 4 tracks by Behling & Simpson. You may well know Bristol’s Behling & Simpson for their chunky, slow-mo releases on Futureboogie, 2020 Midnight Visions, Applepips and Outernational, or their underground edits of Faith Evans, Ciara and Julio Bashmore. And you may have heard their tunes in sets by people like Jackmaster, X-Press 2, Tensnake, Midland, Funk D’Void and Pete Tong, amongst others. For this 4 track EP on Berlin’s Exploited Records, the duo continue their run of exquisitely produced, distinctive house music, retaining their unique sound whilst also embracing faster tempos than previously. Already causing a buzz in label boss Shir Khan’s DJ Sets in Ibiza and Barcelona, ‘Hurt Me More’ works with the classic house-music paradox of ‘uplifting melancholy’, as a euphoric disco loop is paired with a soulful vocal, deeper rhode chords and that unmistakeable Behling & Simpson drum work. Having first appeared on the lead track of their 2020 Midnight Visions EP (‘Closer’), Behling & Simpson team up again with singer Shanti Celeste for one of their toughest beats to date. Deliciously warm subs and a tuff metallic percussion section work perfectly with Shanti’s life-affirming vocal and classic house pianos. Could you call it ‘slow speed garage’? Bouncing 808 bass meets New Jack Swing vocals and New York brass stabs over a seriously grooved drum track. Pumping compressed drums, analogue sub bass, filtered techno stabs and an improvised synth string line… Perfect for those eyes down, groove-led moments.